Faced with complex integrated systems, engineers need a sophisticated, flexible measurement solution for R&D, validation, and troubleshooting. 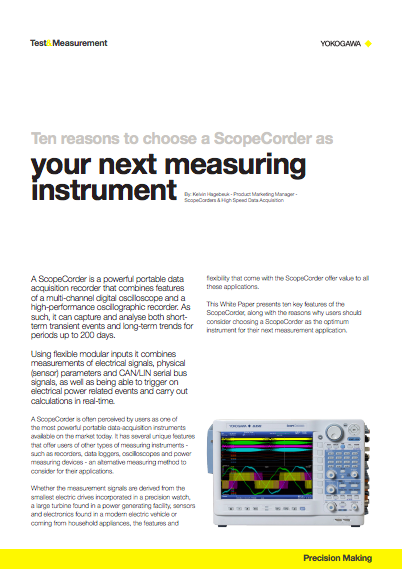 ScopeCorders meet this challenge with built-in analysis and recording functions in an all-in-one data acquisition solution. Integrated: Automate your measurements and analysis by making menu selections - no programming required. Configurable: Simultaneously capture data from any of 20 different modules. High Fidelity: Trustworthy measurements even in the noisiest environments. An all-in-one electromechanical measurement system offering the deepest measurement and analysis features to turn data into insights. A compact, battery-powered, touch screen instrument you can take into the field featuring the deep measurement and recording capabilities you need in the lab. A headless ScopeCorder system capable of connecting multiple chassis into one PC-based system. Testing actuation of a side impact airbag to measure the optimal timing. 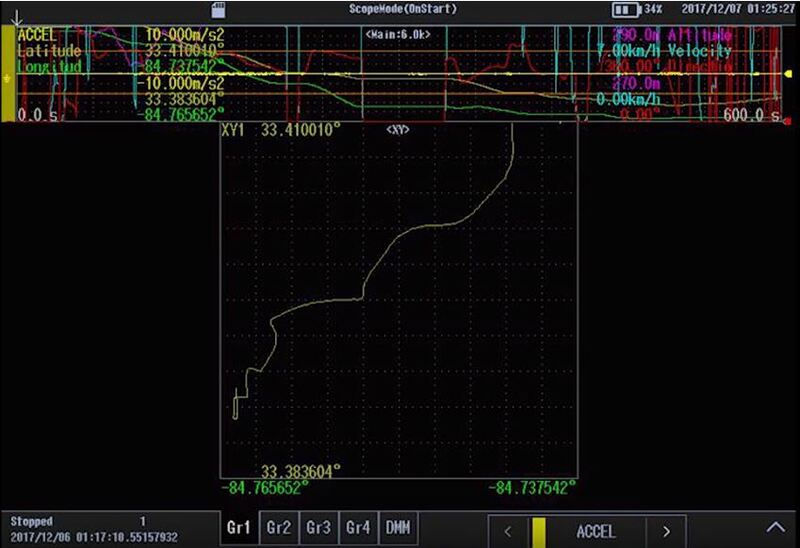 Using the OR trigger and Dual Capture, it is easy to trap and record failure conditions on electrical harnessses (wiring interconnects) over a long duration test. How to use built-in calculations to analyze motor rotor position and find the relative angle between the rotor and sensors such as encoders or resolvers. How can I capture data from motion sensors synchronized with other analog data? The Yokogawa ScopeCorder series of instruments feature input modules and functions to make this possible. The Yokogawa DL850E is a waveform measuring and recording instrument with eight slots for signal conditioning and data acquisition modules. 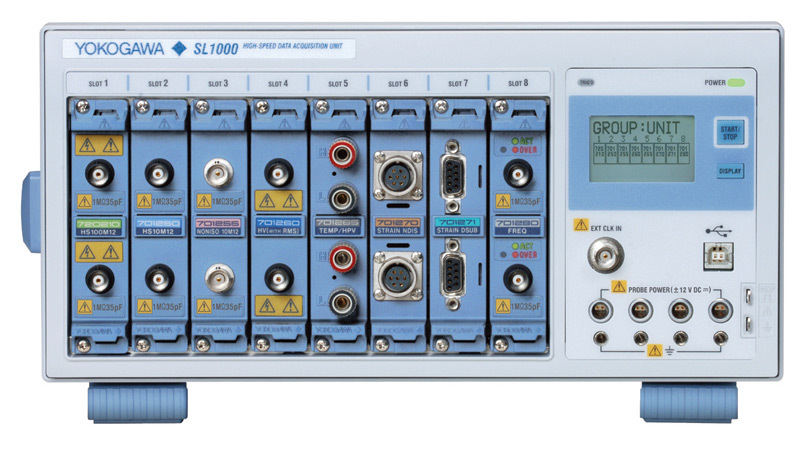 In addition to high-speed signal inputs up to 100 MHz sampling rate, the DL850E has features for real-time signal processing that provide advantages to scientists and engineers trying to observe complex systems. The maximum external HDD size is 1.5 TB. Unfortunately, it does not work for the files created on a DL750. It is a dedicated feature available only for the DL850/DL850V. Yes, the following attached file contains sample C/C++ and Visual Basic programs for controlling the DL850/DL850V. You can also obtain the latest sample programs from the Software Downloads sections on y-Link. Unfortunately, the DL850 is neither IVI nor LXI compliant and there are no drivers for either standards. The largest flash drive size that can be detected by the DL850 is 16 GB. The largest external hard drive size that can be detected by the DL850 is 1.5 TB. Unfortunately it is not possible to convert a .WVF file to a .WDF file. A .WVF file saved by a DL750 can only be loaded in Xviewer or a DL750. Xviewer is capable of loading both .WVF and .WDF file formats. No, if you send commands simultaneously from another communications interface, that has not been selected on the DL850/DL850V, the instrument will not execute the commands properly. 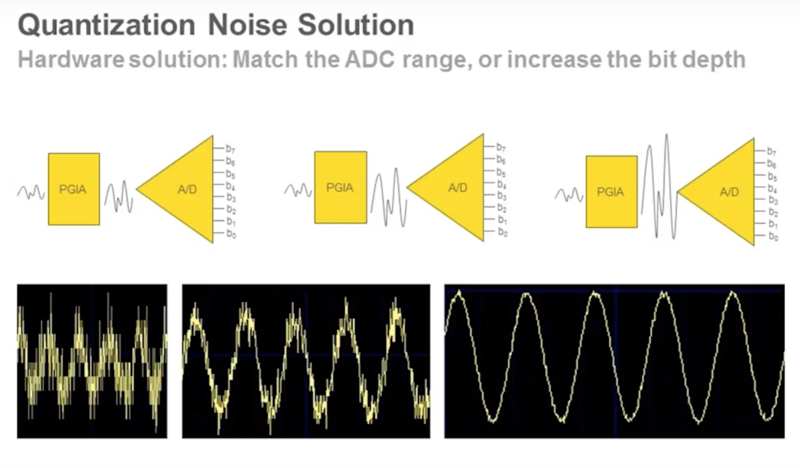 High Resolution mode can be used to remove high frequency noise and increase vertical resolution. It achieves this by increasing the number of effective bits per data to 12-bits through digital and bandwidth filters. Microsoft(R) Excel 97 and 2000 only. In free run mode, the execution timing is different depending on the type of computation. In the case of computations such as FFT, Filter, pulse width, etc. various data are arranged in a chronological direction. The sanitation procedure for various Yokogawa oscilloscopes have been documented below. 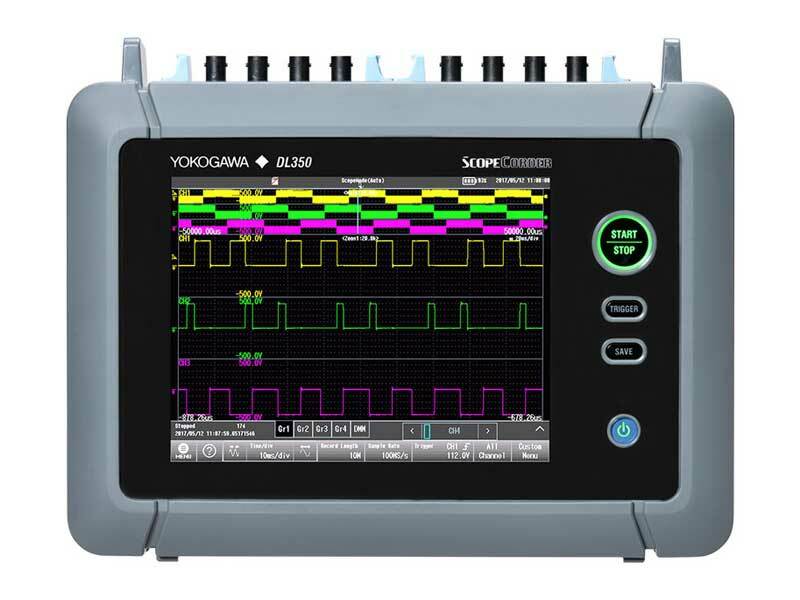 Please download the document or pdf that refers to your Yokogawa oscilloscope. No, the SL1000 and 720210 service manual does not include any adjustment procedures however, it does contain the inspection procedure (QIS). Yes you can load the setup files *.WES that was saved using the older version of the WE Control Software onto the newer version of the WE Control Software. Please follow the procedures listed in the attached PDF file. Yes, you can use the 700929 isolated probe with non-isolated input modules. Please follow the procedures listed in the attached document for instructions on how to update the firmware on the SL1000. Please make sure you have the latest version of Xviewer installed. Please download and view the attached PowerPoint presentation for a comprehensive guide on how to operate the DL850 Dual Capture mode. Please see the attached "DL850 Wave Window FAQ.zip" for detailed instructions and setup feature explanations. There is also a wave window FAQ discussion included in the zip file. Please download and see the attached DL850 IRIG Tutorial presentation. Yes the operating temperature range of the individual modules is the same as the operating temperature range of the DL850/DL750 main chassis unit. Yes, you can use GPIB to remotely control the DL850/DL850 using Xviewer or LabVIEW and have the scope save data onto a shared network drive using the Ethernet interface. There is no limitation. A single DL850 unit can support 128 channels. INTEG1 vs INTEG2 - as demonstrated on DL850 G3 Examples of two different ways to INTEGRATE on the DL850/G3 DSP. One attachment. DL850 .WDF File will not open with Xviewer 1.64 Solution: Please update to latest version (now at version 1.72). DL750 web server with IE8 and Windows XP 32bit OS If IE8 cannot load the DL750 WebServer, and the runtime has been installed: In Internet Explorer, add the IP of the DL750 URL to the list of "Trusted Sites" .. Please see the attachment file for more details. The DL750 does not support encrypted USB thumb drives. Please use non-encrypted USB thumb drives to save waveform data or other data files. No, as described in the service manual, either the 701250/701255 10 MS/sec or the 720210 100 MS/sec modules is required for time base calibration. Please see the attachment "Self-Paced Exercises for SL1400.PDF" for a set of easy exercises suitable for the SL1400 beginner. Unfortunately, waveform data saved by Xviewer in the *.WVF, *.CSV, or *.FLD format cannot be loaded onto DL series instruments. Port #10,001 needs to be opened via your firewall in order to connect WirePuller with the DL750. A through-firewall connection may also be required for port-forwarding. The maximum number of 720230 Logic Input Modules that can be installed on the DL850 is 8 or 128 logic bits. The bandwidth for the 720210 100 MS/s is 20Mhz. The maximum recording time (observation time) of the DL850/DL850V in normal mode or real time recording mode is 30 days. The only difference is that the CAN bus monitor module works with the DL850V only and the front panel sheet color is different. Yes, there is a modification kit to modify the DL850 to DL850V. Please contact your nearest Yokogawa representative for more details. No, the 16 Channel Voltage Input Module cannot be used to measure temperature. There are no dedicated probe for the 720240 CAN bus monitoring module. The module requires a direct input D-sub 9 pin connector cable. No, the DL850/DL850V does not have a chart recorder mode. Yes, the DL850/DL850V will work with a solid-state eSATA external HDD. No, the DL850 / DL850V does not have an acquisition memory backup battery. The On Start Trigger Mode (Log Mode for the DL750) will perform a single waveform acqusition immediately when you press the START key. Yes, please use an IRIG timecode generator with a GPS clock source. Yes, Xviewer can be used to display the waveform data from multiple DL850's into a single window display with the data synchronized over time. GigaZoom II is a display processor implemented via architectural technology on an FPGA. Yes, the IRIG B feature can synchronize the clocks of several DL850s in one location. Yes, the IRIG B feature does allow the synchronous clock operation of multiple DL850's in several locations. It will require an IRIG generator with a GPS source. Yes, please use the trigger in/out function or the time trigger to synchronize the trigger input to each DL850. You can input up to 16 characters in a waveform label, but the DL850 will only display 8 characters max. The maximum compatible eSATA external HDD size is 1.5 TB. The external HDD recording function performs the same as the internal HDD. The actual data transfer for internal and external HDD is 3.2 MB/s. No, the DL850/DL850V can only stream realtime data to an external hard drive or the internal hard drive. Typically, a portable scope or test tool is used by an engineer to diagnose faults on a production line in real-time, or to carry out tests in a workshop. But how can faults be detected and diagnosed when they are intermittent and the engineer needs to be somewhere else? On the other hand, a portable data logger can capture lots of data, including the faults over a period of time, but requires the data to be searched and analysed later to make sense of it. As a one of the largest motorcycle manufacturers, Triumph confirms every bike is precision-engineered to deliver a complete riding experience. To ensure higher performance and efficiency of the motorcycle powertrain, Triumph test their engines under rigorous conditions, measuring and analyzing a vast array of parameters under varying conditions, from sensors configured and positioned all around a bike. 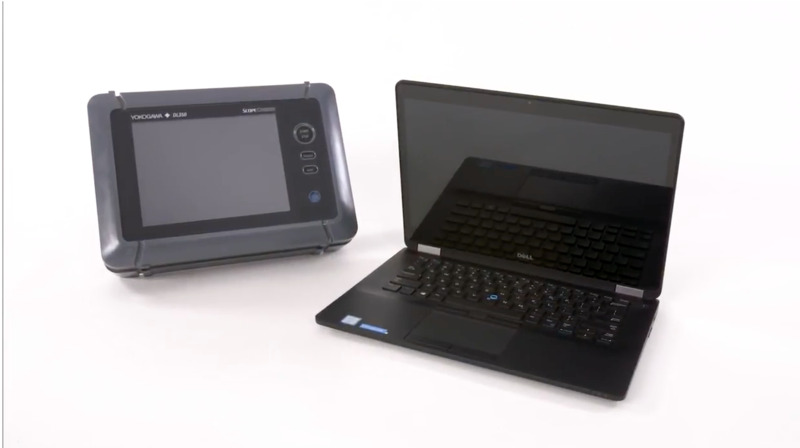 In this video we review the major features of the DL350 showcasing its portability, functionality, and operability. This device features battery power, 18 signal conditioning input modules, and touchscreen access to enhanced triggers, math, and analysis. Watch a step-by-step walkthrough of recording GPS position and motion data on the DL350. 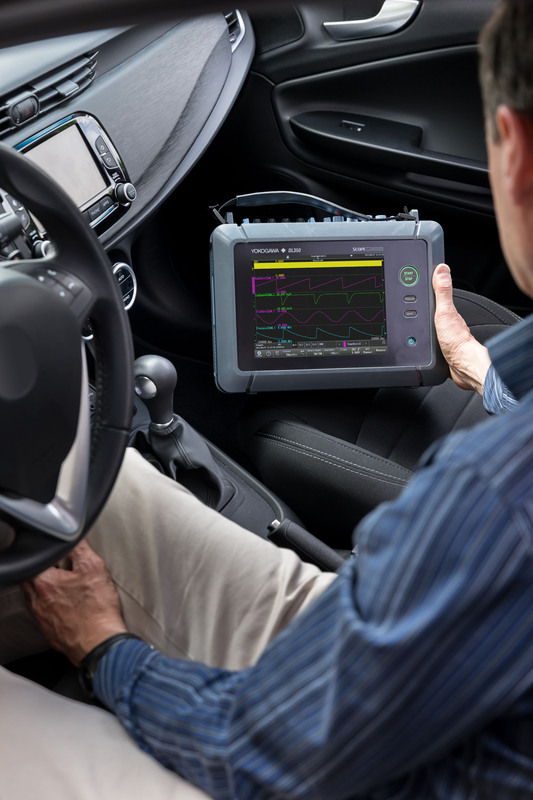 Capture, display, record and analyze the widest variety of electrical and physical parameters in automotive, transportation, electronics, energy and mechatronics. 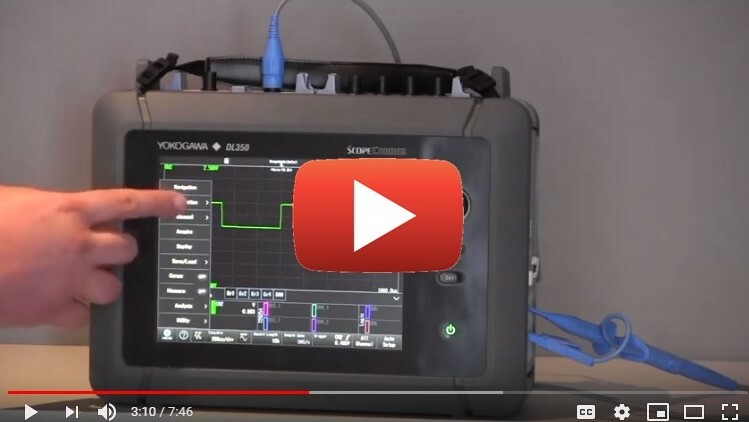 In this video Lee Thomas, Yokogawa T&M Sales Manager in the UK showcases the Yokogawa DL350 ScopeCorder. Using the DL350 Memory Recorder Mode Easy Setup, combined with a 16-channel thermocouple input, it's easy to record hours, days, or weeks of data with a few simple settings. In this video we demonstrate the GPS data logging capability of the DL350 Portable ScopeCorder. Recording Position, Velocity, and Altitude simultaneously with accelerometers or other analog inputs is simple with the DL350's built-in features. In this video we demonstrate the automotive bus decoding features of the DL850EV ScopeCorder. 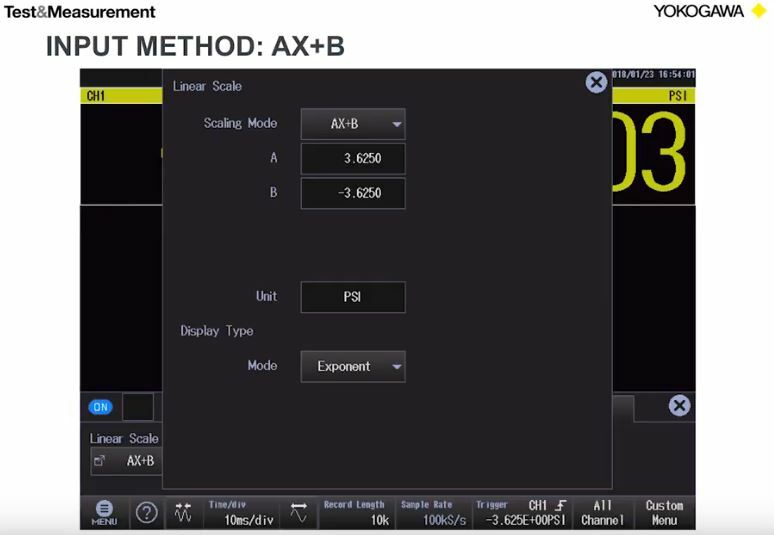 In this video, Dami Ashebu, an Application Engineer with Yokogawa Test and Measurement discusses how a DL850EV data acquisition system can be used to gather various analog and serial bus data for systems validation and reverse engineering in the automotive industry. 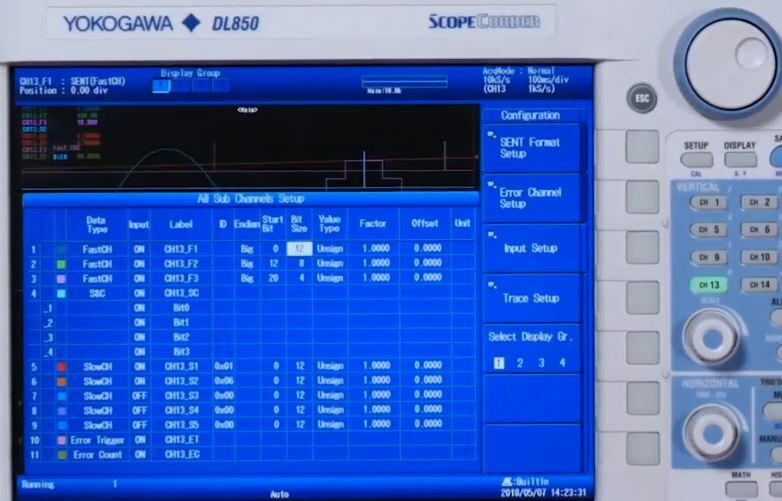 A demonstration reading a 4 - 20 mA transducer into an analog channel on the DL350 Portable ScopeCorder.